Mankind’s connection with the sea allows the concepts of conservation of natural resources, preservation of human culture and history, and sustainable lifestyles to find a perfect interpretation in Tai­jiang National Park. Let us really think about the value of this place, how to carry forward the wisdom of our ancestors, and our interactions with other species, so as to attain the goal of ecological balance and raise the quality and visibility of Taiwan’s contributions to international conservation. 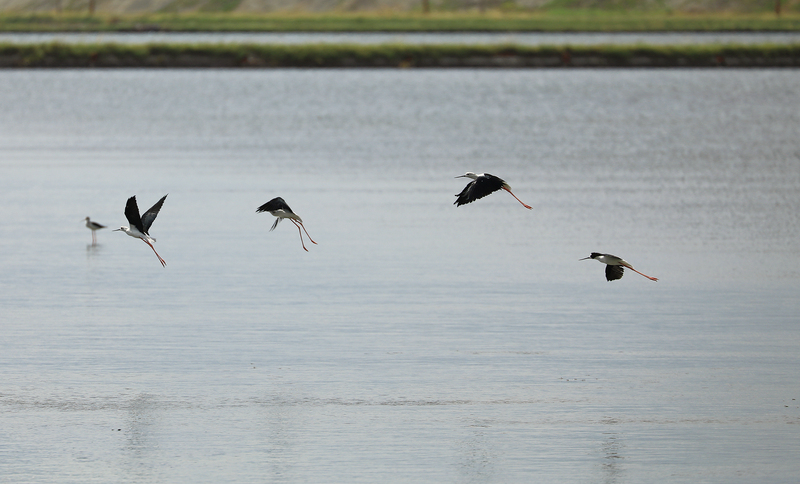 In 1990 there were only 300 black-faced spoonbills in the world, and less than 150 of them came to winter in Taiwan. But in 2017, their worldwide population stands at 3,941, of which 2,601 wintered in Taiwan, accounting for 66% of the global total and ranking first in the world. This turnaround is a proud achievement for wildlife conservation in Taiwan, and is a result of non-governmental groups working as one with the government. It also stands as a shining example of international cooperation in conservation. 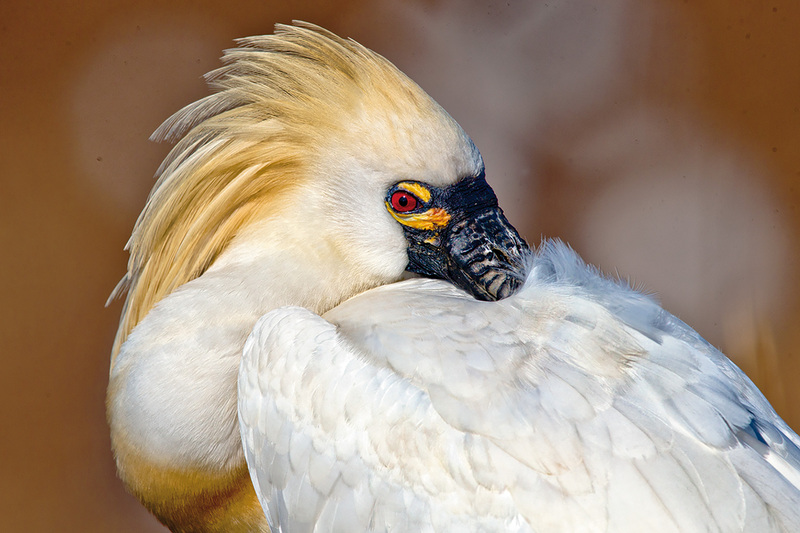 “It was in about 1988 or 1989 that we discovered that the black-faced spoonbill was one of the most endangered bird species in the world. Through the efforts of NGOs, the Forestry Bureau, and local governments, a popular conservation consciousness gradually emerged, to allow this species to continue to exist,” says La­fei ­Kuang-ying ­Huang, chief of Taijiang National Park’s Liu­kong Service Station. This conservation effort has been a long process. 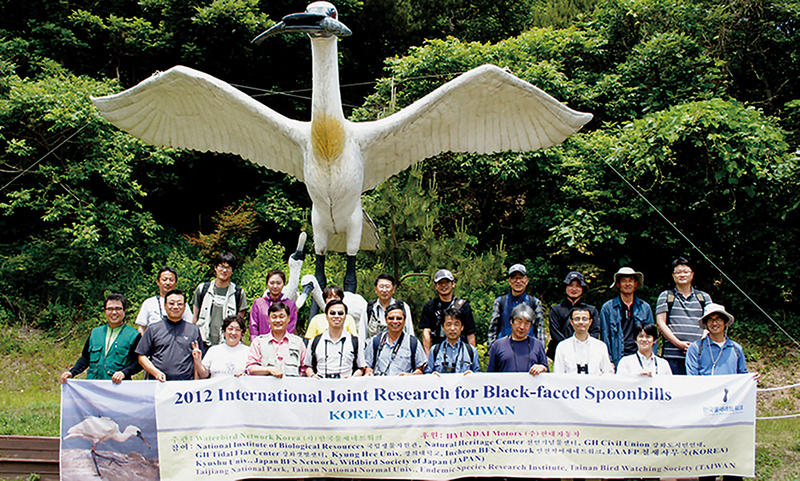 At that time, internally Taiwan was going through the controversy surrounding the proposed construction of the Bin­nan industrial park on the coast of Tai­nan, promoted by companies like ­Tun­tex and Yieh ­Loong, as well as the impact of an incident in which some black-faced spoonbills were shot. Meanwhile on the international front the US had asserted that Taiwan had failed to effectively halt the sale of products made from protected species, and had imposed economic sanctions under the Pelly Amendment. These events injected a degree of respect for the environment, and consideration of environmental issues, into the policymaking of the time, which had thus far placed economic development first and foremost. Against this background, in 1992 the Wild Bird Society of Tai­nan was founded, with the primary object of protecting the black-faced spoonbill. 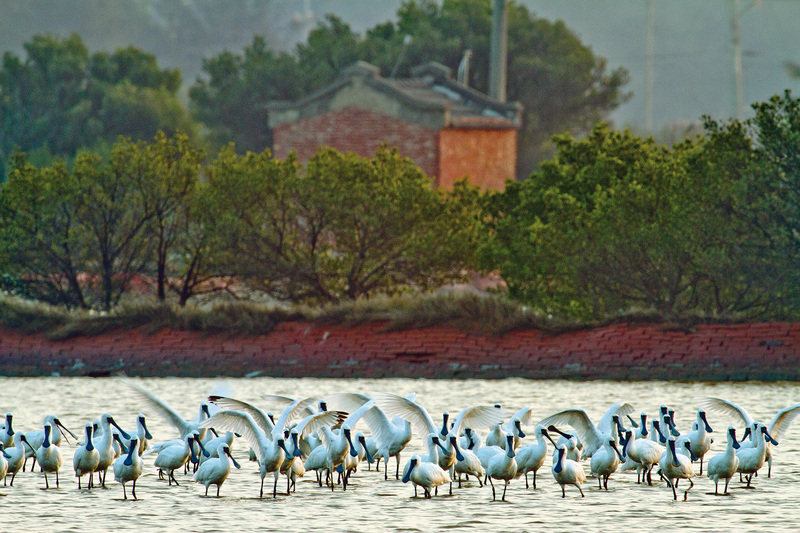 It was only through years of effort and collaboration between local NGOs, experts and scholars, and influential local figures, along with the concerted assistance of the Tai­nan county and city governments, that Tai­jiang National Park could be successfully established in 2009, securing a safe wintering habitat for the black-faced spoonbill in the Qigu Wetlands and the Zeng­wen River estuary. 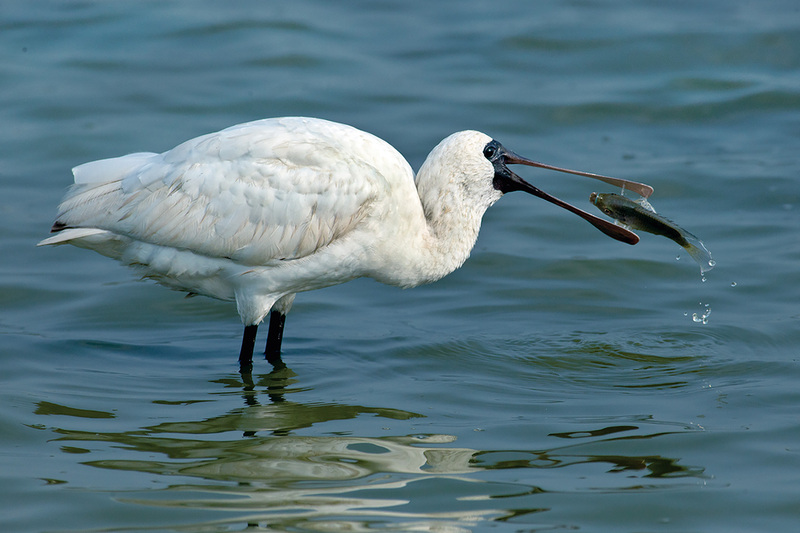 The fortunes of the black-faced spoonbill are closely connected to aquaculture practices. Traditionally, milkfish have been raised along the Tai­nan coast in shallow ponds, and the slack period between fish breeding ­cycles coincides with the spoonbill’s overwintering season, allowing the birds to feed on small fish and crustaceans remaining in the ponds after the milkfish are harvested. However, the higher-value groupers and clams that have been increasingly popular with fish farmers in recent years require deeper ponds, and are reared intensively all year round with no rest period, in operations that generate large amounts of effluent. Because the black-faced spoonbill is a wader, the depth of the traditional shallower milkfish ponds was well matched to its feeding habits, as was the timing of the milkfish rearing cycle. But the trend toward year-round intensive aqua­culture in deep ponds has greatly restricted the spoonbill’s food sources, threatening the birds’ survival. “Let people use the ponds for half the year, and let birds use them for the other half.” From April to October, fish farmers traditionally raised milkfish in shallow ponds at low densities and with minimal inputs. Then, from October to April, it was the season when the black-faced spoonbill overwinters in Taiwan. After the milkfish were harvested, the water levels in the ponds were lowered, and the birds were able to feed on the assorted small fish and crustaceans that remained in the bottoms of the ponds. 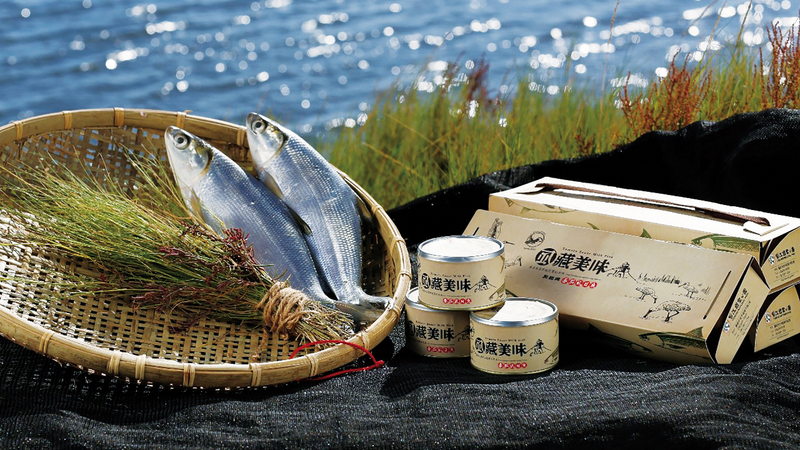 This seasonal cycle dates back 300 years to when the Dutch first introduced milkfish farming to Taiwan. It embodies the concept of preserving an organic, dynamic and sustainable cultural landscape, an idea that also implies ecological protection. Describing the experimental “bird-friendly aquaculture” operations on the Qigu Campus of National University of Tai­nan, Associate Professor Wang Yi-­kuang of the Department of Ecology and Environmental Resources says: “The whole experiment was mainly based on the seasonal nature of shallow-pond milkfish farming, which operates from April to around the end of October. After the fish were harvested, we undertook comparative experiments with lower water levels.” The comparisons showed that lowering the water levels had a significant effect on the use of the ponds by black-faced spoonbill and other waders such as great and little white egrets, as well as some shorebirds that forage on beaches and exposed mudflats at low tide. The result of several years of experimenting was that adjusting the water level in fish ponds had a clear impact on the numbers of birds that gathered there. 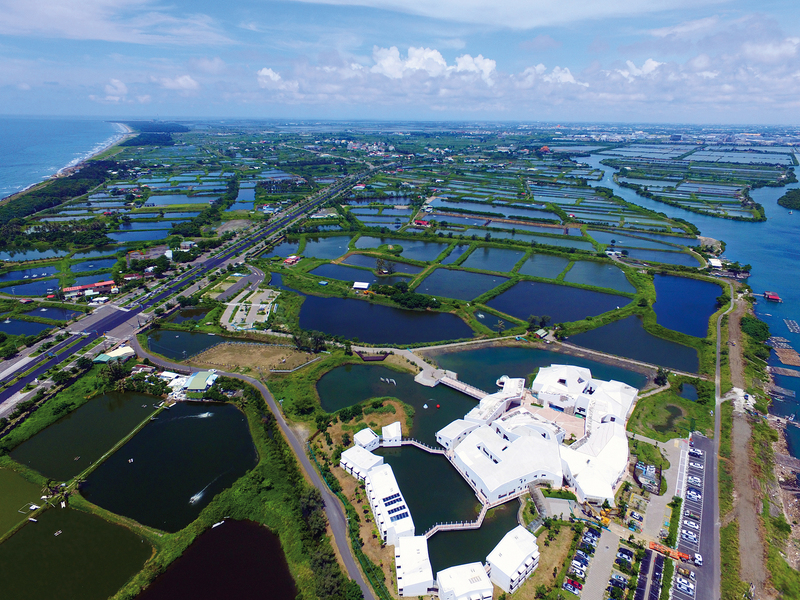 “It would only take one-tenth of the aquaculture area of each fish farm in the Qigu District being used for low-intensity shallow-pool aquaculture, to meet the needs of the black-faced spoonbill and its companion water birds when they winter in Taiwan,” says ­La­fei ­Huang. Shallow-pool milkfish farming can also be used to raise fish fry and fingerlings for use as bait by the deep-sea long-line tuna fishing industry, and the Fisheries Research Institute is currently promoting the production of soft-boned milkfish under 20 centimeters in length, for which it has published recipes. Milkfish mainly eat algae, so they are a low-energy, low-carbon aquaculture species. By contrast, when carnivorous fish species eat smaller fish and crustaceans, at each link in the food chain only a tenth of the calories of the prey go to add weight to the predator. And when milkfish are raised in shallow ponds that are left to the birds for half of each year, and are combined with local ingredients to be canned or to make fish fillets and fish balls, vendors can make use of the “HappyMilk­fish” certification mark for spoonbill-friendly fish ponds to create a branding effect and build brand value. “After the passage of the Wetland Conservation Act, the very first wetlands certification mark was granted to Tai­jiang National Park,” says ­Chang Wei-­chuan, director of the National Parks Division at the Construction and Planning Administration of the Ministry of the Interior. “Besides expressing the importance of conserving our wetlands and the black-faced spoonbill, we also hoped the environmentally friendly products bearing the mark would appeal to consumers.” As hoped, the spoonbill-friendly “HappyMilkfish” brand products that went on sale at the Tai­pei Expo Park in 2016 proved very popular, and are said to have sold out almost as soon as they were put on display. Ecotourism has three distinguishing features. Firstly, it has a high cost per individual visitor, to limit the number of people who take part. Secondly, it is intellectual in nature, and tourists who participate gain in terms of knowledge. Thirdly, profits must come back to the locality. La­fei ­Huang says, “If fish farmers can become guides, then in the off season for aquaculture they can use their boats to guide tourists.” Qigu Lagoon has 15 fishing rafts that do ecotourism, and fishermen take visitors out on lagoon tours. Besides learning about the black-faced spoonbill, they can also get to know an important national wetland, see the black-faced spoonbill’s companion bird species, and experience the environment of Taiwan’s largest lagoon. When it comes to accommodation for tourists, Philip Tung-hui Kuo, executive secretary of the Wild Bird Society of Tai­nan, argues: “Building big hotels is not as good as operating homestays with local color.” A stay in a renovated, formerly abandoned old house in a fishing village combines well with ecological mini-trips to the birdwatching hides of Tai­jiang National Park or through the Si­cao Green Tunnel, and with other activities such as painting. A lifestyle that combines nature, culture, and heritage embodies the spirit of the “Sa­toyama and Sa­toumi Initiatives” that were proposed in 2010 at the 10th Conference of the Parties to the UN Convention on Biological Diversity, and allows residents of coastal areas to use their way of life, along with their knowledge, understanding, and conservation of the land, to live sustainably. This is also the main reason why in 2013 Tai­jiang National Park, the Forestry Bureau and the Tai­nan City Government jointly received a Conservation Achievement Award from BirdLife International, the world’s largest bird conservation organization. In addition, Tai­jiang National Park and the Wild Bird Society of Tai­nan worked with Professor Wang Ying of the School of Life Science at National Taiwan Normal University to put leg bands on many tens of black-faced spoonbills. 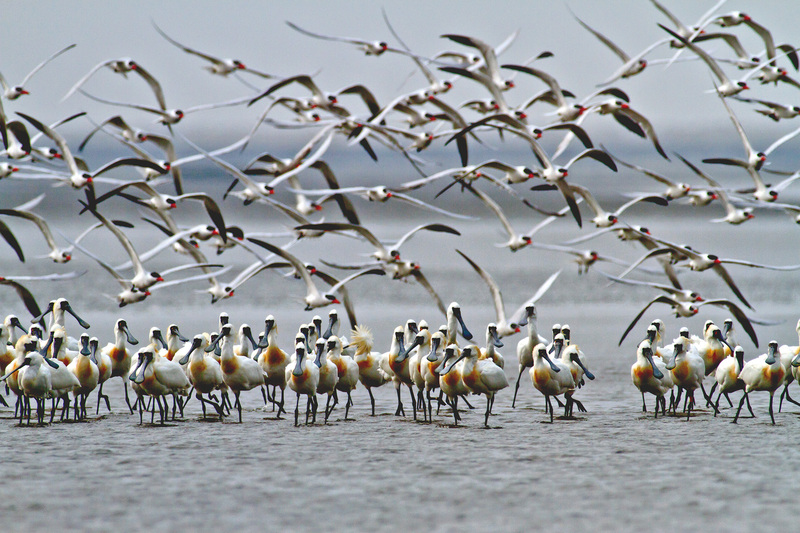 Thanks to information sharing with Korea, Japan, mainland China, and Vietnam, they gradually traced out the range and migration routes of the black-faced spoonbill. If forests are the lungs of the Earth, wetlands are the kidneys, responsible for cleaning the water of a whole watershed, as well as their role in flood detention. They are also important source areas for producing fish fry and crustacean larvae. 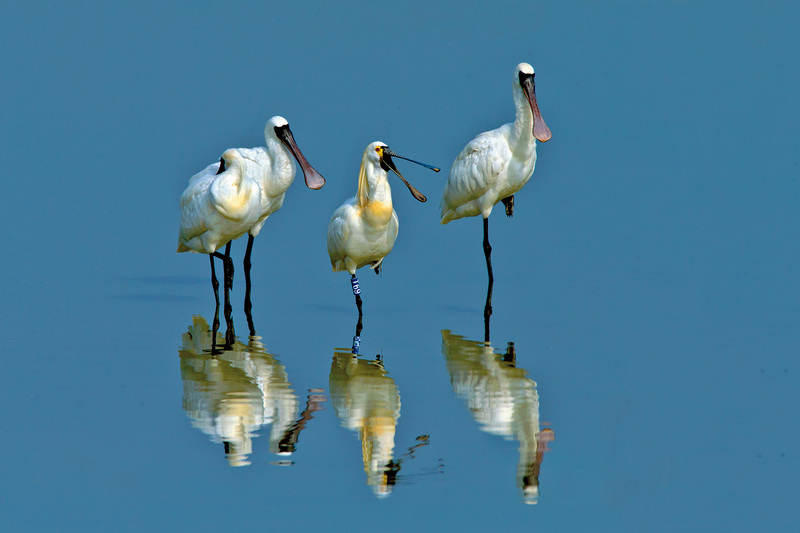 The conservation of the Qigu Lagoon and surrounding wetlands is the result of the “umbrella species” status of the black-faced spoonbill. Efforts by government, NGOs, academia, and industry have enabled all kinds of spoonbill-friendly measures to nurture this dynamic, organic cultural landscape, allowing it to continue to operate sustainably, and this is the greatest significance of the conservation of the black-faced spoonbill. For what it represents is the aquaculture history of Tai­nan over the past 300 years, as well as how we understand and treat this saltwater wetland that is part of our lives.